Motorcycles are often viewed as being dangerous, with riders stereotyped as reckless with their personal safety. However, this is an unfair and inaccurate perspective of cyclists. In fact, in collisions involving motorcycles and passenger vehicles, the driver of the car or truck is more likely to be at fault for the accident. This means motorcyclists must take extra precautions to protect themselves on the road. New motorcycle riders should always take a safety class before earning their license, but it's also a good idea for experienced riders to periodically take a refresher course. The information you learn could very well save your life. In many cases, completion of these classes can also earn you an insurance discount. 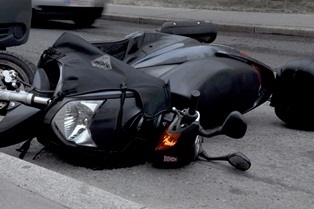 Many motorcycle accidents happen simply because drivers don't see bikes on the road due to their smaller profile. You can increase your visibility by adding reflective tape to your motorcycle jacket or wearing a reflective vest. Light colored helmets and light-colored bikes are also helpful. Patches of sand, potholes, and railroad tracks can easily make you lose control if you are caught off guard. Never allow yourself to be distracted. Pay attention to blind spots. Getting caught in a driver's blind spot can have disastrous consequences. If you think a driver doesn't see you, honk. Half of all motorcycle crashes occur at intersections, with a motorist making a left turn being the most common cause of accidents. Remain extra vigilant at intersections. Speeding is a factor in more than one-third of motorcycle accidents. Always obey the posted speed limit. If you're in heavy traffic or visibility is poor, slowing down is the safest course of action. If you're traveling long distances, schedule ample opportunities for breaks. Riding too long without a rest period taxes your concentration and slows your reaction time. In groups, ride in a staggered formation. Bike trips with friends can make unforgettable memories, but you don't want those memories to include an accident. Riding in a staggered formation gives everyone space to react and prevents one inattentive person from causing a chain-reaction collision. Limit travel in bad weather. Poor weather conditions make it harder to operate your bike safely and increase the odds of mistakes made by other drivers. If you have an alternative form of transportation, it's best to save your bike for sunny days. Alcohol is a factor in almost 50% of single vehicle accidents. Staying sober dramatically reduces your crash risk. Seek the necessary medical attention for injuries, reporting all symptoms you are experiencing even if they seem relatively minor. Have someone take photos of the accident scene, your bike, and your visible injuries. Get names and contact information for witnesses. Save any bills, test results, or other documentation you receive to prove your damages. If you've been injured in a motorcycle accident caused by another party's negligence, you are eligible to file a personal injury claim seeking compensation for medical expenses, lost wages, and pain and suffering. If you were partially at fault for the accident, you can still file a claim. However, your settlement will be proportionately reduced by your assigned percentage of fault. In most cases, Louisiana law allows you one year from the date of the accident to file your personal injury claim. Retaining an experienced attorney is the best way to protect your rights throughout this process, since insurance companies are focused on protecting their bottom line—not providing you with a fair settlement.